AMID ALL THE NEWS COVERAGE of this weekend's "Carmageddon" shutdown of the 405 have been historic pictures of the Sepulveda Pass. This impossibly busy thoroughfare didn't get a paved road until the 1920s, so the photos are fun to look at. If you know where to look, you can see Mount St. Mary's College. 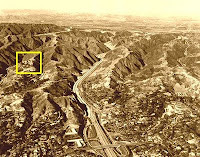 The small picture at right from 1961 (before the Bel Air Fire) was reproduced in the Los Angeles Times, and I've marked the College in yellow. 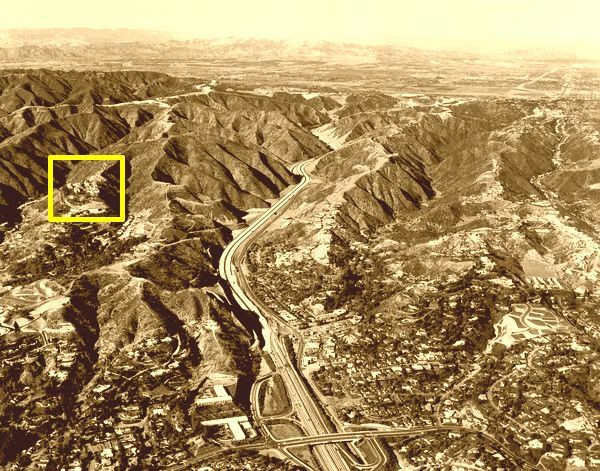 It really shows what a visible landmark the College was in the 70 years before the Getty Center was built. The picture at top is taken from the west in 1956 or -57. 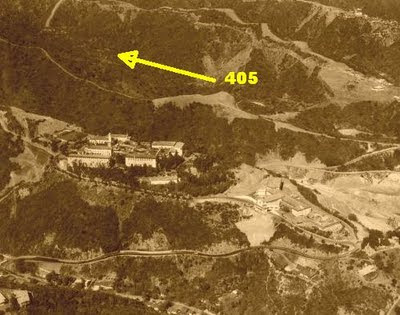 Alone on its hill, the College could see -- and be seen from -- much of Los Angeles. It's astonishing to see how bare the canyon was in those days before the 405 pushed through. Our oldest alumnae still long for the days when you could see the Mount from Santa Monica, the only light source in the otherwise black mountain front. The shrine to Our Lady of the Mount on the western slope was lit up all night and served as a beacon to boats out on the Bay. As the college grew, so did its nighttime signature. One night early in World War II, a panicky neighbor called the college to demand that the spotlights illuminating Mary Chapel be doused immediately lest the Japanese home in on them and bomb the Westside. The College complied. A few people express quiet regret about the loss of the Mount's landmark prominence in the shadow of the Getty. One of the CSJs told me last year that the community had always been told that their 180-degree view from Carondelet Center was to be "preserved in perpetuity," and that the entire canyon was part of some kind of "trust" that would prevent construction. The sisters were as surprised as anyone when the Getty Trust proved otherwise. The college is closing for Carmageddon (as is the Getty). It's hard enough to get here on a normal day! For one weekend, though, the Sepulveda Pass will revert to impassable and the Mount will enjoy a bit of its old solitude. I think I'm going to bring my sleeping bag and camp out in the library stacks all weekend. It will be the best place to hide out from all the "Carmageddon" mayhem.